Seventy-one year ago, February 2, 1943, the The Battle of Stalingrad, finally ended. After five months of unrelenting battle, the retreat of the Nazis became the turning point of World War II. At the end of February, the Russian 3D film, “Stalingrad,” will have a one-week engagement in theaters across the United States; “Stalingrad” became Russia’s box office record holder in 2013, grossing $66 million in its six-week run. 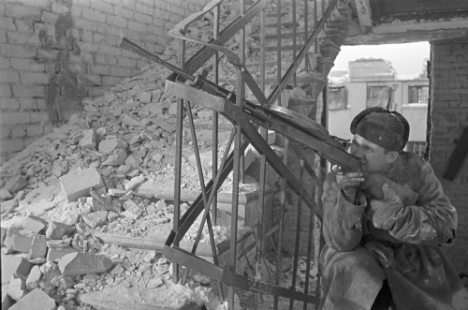 “It is pure hell here.” This is how soldiers and officers of the Wehrmacht characterized their situation after they ended up in the ring formed by the Red Army in the Stalingrad region. In this “cauldron,” 22 divisions and more than 160 separate units of the German 6th Army and part of the 4th Panzer Army — amounting to 330,000 people — were trapped. Among the trophies of the Soviet troops was an enormous field post office of the adversary, along with diaries and other writings by captured soldiers. The majority of the writings date from November and December of 1942 and the first half of January 1943. The most informative letters were published in 1944 by the military publishing house of the People’s Commissariat of the Defence of the USSR in a compact volume titled “The Defeat of the Germans at Stalingrad. Confessions of the Enemy.” The print run was not specified, and the book was printed on the simplest paper and released as a paperback not meant to be kept for a long time. The book became a bibliographic rarity. The letters of the German soldiers are imbued with frankness, an effort to communicate impressions to relatives, an effort to share the truth about the combats in the Stalingrad region, and soldiers’ assessment of the strength of the Red Army. These letters and diaries are lively and direct testimonials about the war by those who were on the front line, beyond the trenches and bunkers. From a letter from Private First Class Walter Oppermann, no. 44111, to his brother, November 18, 1942. From a letter from soldier Heinrich Malchus, no. 17189, to Private First Class Karl Weitzel, November 13, 1942. From a letter from Senior Lance Corporal Joseph Tzimach, no. 27800, to his parents, November 20, 1942. “ . . . November 19. If we lose this war, they’ll take revenge on us for everything we did. We killed thousands of Russians and Jews with wives and children around Kiev and Kharkov. This is simply unbelievable. But it is for precisely this reason that we need to exert all our strength in order to win the war. From the diary of Field Gendarmerie Sergeant Helmut Megenburg. From a letter from soldier Otto Zechtig, 1st Company of the 1st Battalion of the 227th Infantry Regiment of the 100th Light Infantry Division, no. 10521 V, to Hetti Kaminskaya, December 29, 1942. “ . . . January 5. Our division has a cemetery near Stalingrad where more than 1,000 people are buried. It’s just terrible. People who are now sent from transport units to the infantry are as good as sentenced to death. From the diary of Officer F. P. of the 8th Light Small-Arms Force of the 212th Regiment. From a letter from Senior Lance Corporal Arno Bitz of the 87th Artillery Regiment of the 113th Infantry Division, no. 28329 D, to his fiancée, December 29, 1942. From the testimony of captured Captain Kurt Mandelhelm, commander of the 2nd Battalion of the 518th Infantry Regiment of the 295th Infantry Division, and his adjutant, Lieutenant Karl Gottschaldt, January 15, 1943. From the testimony of captured Private First Class Joseph Schwarz, 10th Company of the 131st Infantry Regiment of the 44th Infantry Division, January 2, 1943. From the testimony of Lieutenant General Alexander von Daniel, commander of the German 376th Infantry Division. First published in Russian in File.rf.